Iupiter right Victory placing a wreath upon a trophy; in exergue ROMA. The victoriatus was a silver coin issued during the Roman Republic from about 221 BC to 170 BC. The obverse of the coin featured the bust of Jupiter and the reverse featured Victory placing a wreath upon a trophy with the inscription "ROMA" in exergue. The coin originally weighed about 3.4 grams (3 scruples), meaning that it was half the value of the quadrigatus, a coin weighing 6 scruples that was by this time no longer produced. 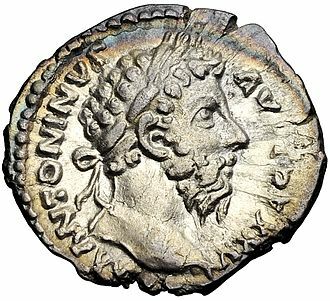 The victoriatus was made of a more debased silver than the denarius, which was introduced at about the same time. Hoard evidence indicates that the coin circulated in southern Italy and later Gaul, indicating that the coin was intended as a replacement for the drachma or half-nomos instead of as part of the normal Roman coin system. When first issued the victoriatus had a value of about 3/4 of a denarius, however when the quinarius was reintroduced in 101 BC with a similar type, it was valued at 1/2 a denarius. This indicates that victoriati that were still in circulation at this time were worn and considered to be worth only half a denarius. 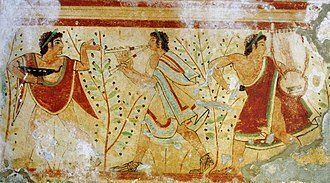 The reintroduced quinarius was produced mainly for Cisalpine Gaul, where the victoriatus and imitations were popular. The reintroduced quinarius may have continued to be called a victoriatus, although there is no written evidence of this. The name victoriatus is an ancient term, attested by several contemporary texts and inscriptions. 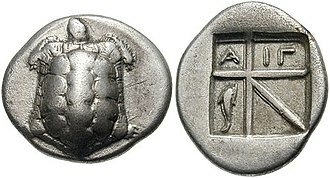 The coin was known as a tropaikon (due to the trophy on the reverse) among Greek speakers. John Melville Jones, A Dictionary of Ancient Roman Coins, London 1990. The aureus was a gold coin of ancient Rome originally valued at 25 pure silver denarii. 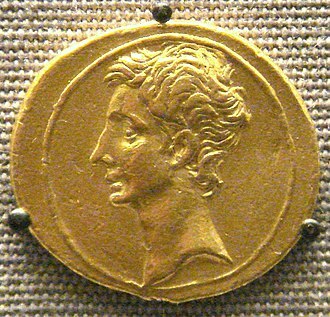 The aureus was regularly issued from the 1st century BC to the beginning of the 4th century AD, Caesar struck the coin more often, and standardized the weight at 140 of a Roman pound. 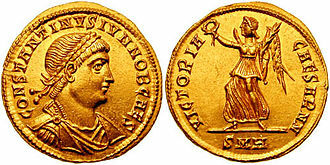 Augustus tariffed the value of the sestertius as 1100 of an aureus, the mass of the aureus was decreased to 145 of a pound during the reign of Nero. 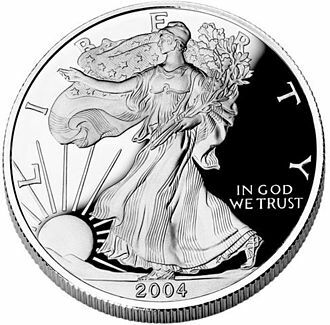 At about the time the purity of the silver coinage was slightly decreased. After the reign of Marcus Aurelius the production of aurei decreased, during the 3rd century, gold pieces were introduced in a variety of fractions and multiples, making it hard to determine the intended denomination of a gold coin. The solidus was first introduced by Diocletian around 301 AD, struck at 60 to the Roman pound of pure gold, Diocletians solidus was struck only in small quantities, and thus had only minimal economic effect. 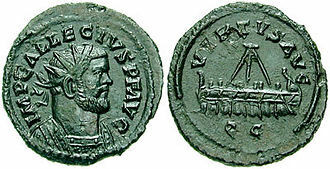 The solidus was reintroduced by Constantine I in 312 AD, permanently replacing the aureus as the coin of the Roman Empire. The solidus was struck at a rate of 72 to a Roman pound of gold, each coin weighing twenty-four Greco-Roman carats. By this time, the solidus was worth 275,000 of the increasingly debased denarii, regardless of the size or weight of the aureus, the coins purity was little affected. Analysis of the Roman aureus shows the purity level usually to have been near to 24 carat gold, inflation was affected by the systematic debasement of the silver denarius, which by the mid-3rd century had practically no silver left in it. In 301, one gold aureus was worth 833⅓ denarii, by 324, in 337, after Constantine converted to the solidus, one solidus was worth 275,000 denarii and finally, by 356, one solidus was worth 4,600,000 denarii. Today, the aureus is highly sought after by collectors because of its purity and value, an aureus is usually much more expensive than a denarius issued by the same emperor. For instance, in one auction, an aureus of Trajan sold for $15,000, two of the most expensive aurei were sold in the same auction in 2008. 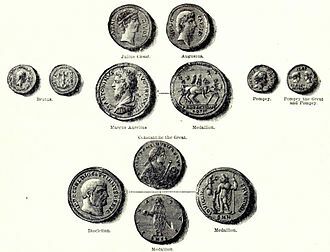 Coinage came late to the Roman Republic compared with the rest of the Mediterranean, especially Greece and Asia Minor where coins were invented in the 7th century BC. The currency of central Italy was influenced by its resources, with bronze being abundant. 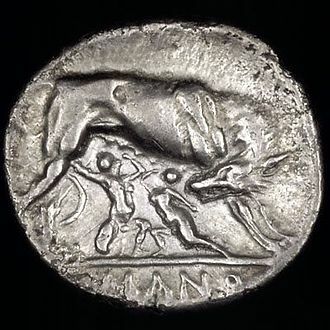 The coinage of the Roman Republic started with a few silver coins apparently devised for trade with the Greek colonies in Southern Italy, during the Second Punic war a flexible system of coins in bronze and gold was created. This system was dominated by the silver denarius, a denomination which remained in circulation for 450 years, the coins of the republic are of particular interest because they were produced by mint magistrates, junior officials who choose the designs and legends. This resulted in the production of advertising the officials families for political purposes. 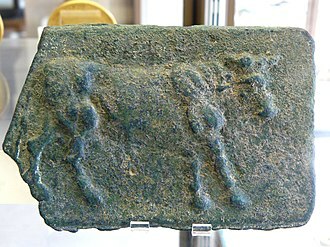 Toward the end of the 4th century BC bronze began to be cast in flat bars which are today, without any historical authority. These bars were heavily leaded, of varying weights although generally on the order of five Roman pounds, and usually had a design on one and both sides. The actual function of aes signatum has been interpreted, although a form of currency they were not coins since they did not adhere to a weight standard. V. A. A. A. F. F. Julius Caesar briefly raised their number to four, according to Suidas, the mint was located in the temple of Juno Moneta on the Capitoline Hill. 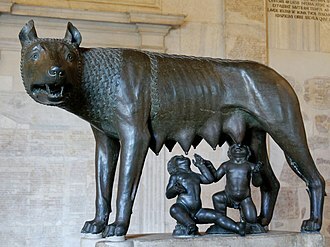 By this time Rome was familiar with coinage, as it had introduced to Italy in the Greek colonies of Metapontum, Croton. Rome had conquered a large portion of central Italy, giving it large quantities of bronze, a system of heavy cast leaded bronze coinage was introduced, these issues are known as aes grave by numismatists. Stylistically the coins were distinctly Roman and, due to both their size and their being cast rather than struck, crude compared to the coinage elsewhere around the Mediterranean at the time. The standard coin was the as, the word as referred to a coin and to a unit of weight – in fact, as could mean any unit – of length, the uncia was thus both a weight and a coin of the weight.